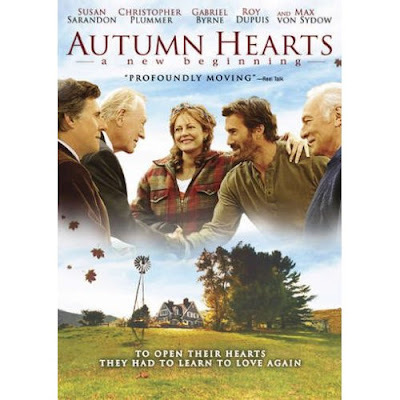 ’s beautiful, tender, and heartbreaking 2007 film starring Susan Sarandon, Christopher Plummer, Max von Sydow, and Gabriel Byrne, neither the original title nor the DVD title will manage to benefit it in the least. The film which screened as the closing night film at last year’s Toronto International Film Festival was first dubbed Emotional Arithmetic — a title taken directly from Canadian author Matt Cohen’s novel upon which it is based. And more recently, it was released as Autumn Hearts: A New Beginning. Therefore, sadly Barzman’s quality film went from a nonsensical and ultimately pretentious name to an overly simplistic one that at best conjures up warm, fuzzy images of Hallmark Hall of Fame films and at worst is one so innocuous that you’ll struggle to recall it as soon as you hit eject. Adding to the confusion is that the film’s official website still uses the old name so it will be hard to track down for those who have been following it since its festival rounds last year and when trying to find information on the film, you have to try searching under both names. Thankfully, IMDb is smart enough to direct those typing in Emotional Arithmetic to the right page but search engines aren’t quite there yet, which is a shame because it’s a touching and affecting work played brilliantly by the leads via an "old fashioned style" concerned primarily with “the emotional journey of the characters,” as Gabriel Byrne notes in a worthwhile behind the scenes featurette on the DVD. Additionally, as someone who believes that perhaps there have been so many WWII films that not only has it become its own genre but that some are hard to tell apart, Barzman’s film — like last year’s Oscar winning foreign film The Counterfeiters -- opened my eyes to something of which I was unaware. Instead of forcing Jewish prisoners to counterfeit funds to aid the German effort, in Hearts (and now I believe you’ll agree that title seems entirely inappropriate) I learned about about the existence of Drancy — a transit work camp that existed just outside of Paris, set up by eager French collaborators working with the Nazis as a stopping point before the Jews were transported to death camps. The film opens in “Quebec’s Eastern Townships region” in September of 1985 as we meet the troubled Melanie Lansing Winters (Susan Sarandon), still haunted by her youth spent in Drancy so much so that she’s taken to devoting her life to collecting data regarding each and every human atrocity committed around the globe. She catalogs them in numerous file cabinets with names, dates, and numbers in the hopes that people will never forget. Married to the cold and bitter professorial husband David Winters (played by Christopher Plummer), as Hearts begins, his mood has also hit an all-time low after he was forced into retirement from academia following a heart attack and plans to sue. Although he seems to blame his wife for her inability to forget the past and move on, her loving and devoted grown son Benjamin (Roy Dupuis) and grandson Timmy (Dakota Goyo) who also live at their large homestead treat Melanie with kid gloves, walking on eggshells and gently reminding her to take her antidepressant medication. Prone to breakdowns and stress, Melanie seems utterly ecstatic when she manages to get in touch with Jakob Bronski (Max von Sydow), the so-called “Poet of the Gulag,” who looked after her as a young girl in Drancy. After surviving the work camp, and later Auschwitz, and years of electroshock therapy in a psychiatric institution, he has finally been freed and agrees to come stay with Melanie in Canada for awhile. While her husband makes it clear that he’s less than thrilled that Melanie has invited what he fears is yet another most likely memory plagued, “emotionally unstable” survivor from the war to live with them, he’s in for a far ruder awakening when Jakob brings with him a surprise for Melanie. For instead of a trinket or bouquet, the gift arrives in the form of Christopher (Gabriel Byrne), another survivor from Drancy who — much like Sarandon’s character — had also lost his parents. Although it’s been rightly argued that essentially “the film is designed like a stage play” and “hardly leaves the house or garden,” for this deceptively photographically idyllic (from one of Canada’s most gifted and award-nominated cameramen Luc Montpellier) and dialogue-heavy film, the staging seems not only appropriate but completely necessary to best serve the highly sensitive and relationship-based material. Cinematically, Hearts owes something to the works of Ingmar Bergman and even Woody Allen’s gloomier works like Interiors and September. And while there are endless arguments as everything is bared over the course of a painful yet air-clearing and cathartic twenty-four hour period that does seem a bit melodramatic at times, the actors all make it work and a great deal is equally owed to its talented director. With a background mostly consisting of television credits and the realization that this is just his second feature film, it’s a remarkable achievement. Additionally, it’s one that seems tailor-made for the filmmaker after a little more digging on IMDb revealed that Barzman himself is no stranger to political conflict and global affairs, having been raised in exile until the early 1970’-s in France as the “son of blacklisted screenwriters Ben Barzman and Norma Barzman” following the McCarthy HUAC hearings of the 1950s. And while I fear that due to the title confusion, it may fall under the radar, in order to prompt you to seek it out (no matter which title you prefer), I’ll leave you with a visual reminder.